spooky owl tours, Frightsville, the Village of Fear at the Scary Maze, magicians and fire jugglers, children’s face painting, crafts and stories. At dusk, the gardens are transformed when the trees and shrubs are lit up with beautiful coloured lights. 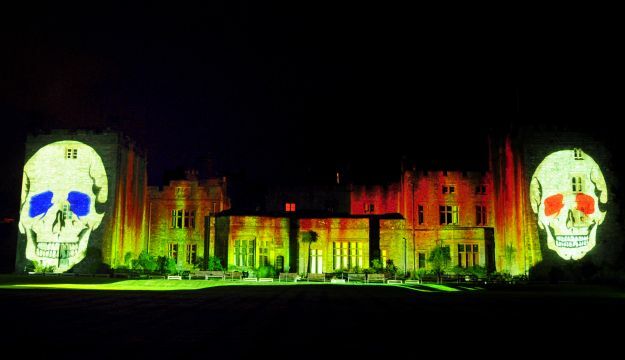 A spooky sound and light show plays across the Castle walls. November 1st – All Hallows Eve party ending with a spectacular family & pet friendly rooftop firework display. Tickets Adult, £17.50, Child 5-15 yrs £8.50 Under 5s go free. Tickets include access to Castle, Gardens, World Owl Trust, ghost tours, plus free entertainers.